This kit is used to repair either fuel pumps, Fig. 1, or vapor pumps, Fig. 2. Follow the procedure for the type of pump you are working on. Some of the components in this kit are not used when repairing a "Vapor Pump." This instruction is the only service information on these pumps. Read thru the instructions carefully before starting work. Call out NUMBERS (1), (2), etc. in the text and illustrations refer ONLY to the specific items in the Contents of Kit illustration and list. Call out LETTERS (A), (B), etc. are used over and over - on different items in other illustrations. Draw in the arrow that points UP, with the pump turned the way it is installed on the motor. 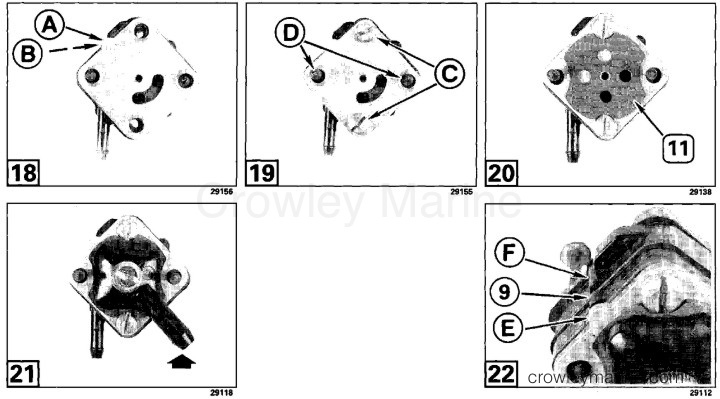 draw in the position of the fuel pump inlet fitting (A), the outlet fitting (B), and the assembly screws (C), relative to the wide valve body tab (D). 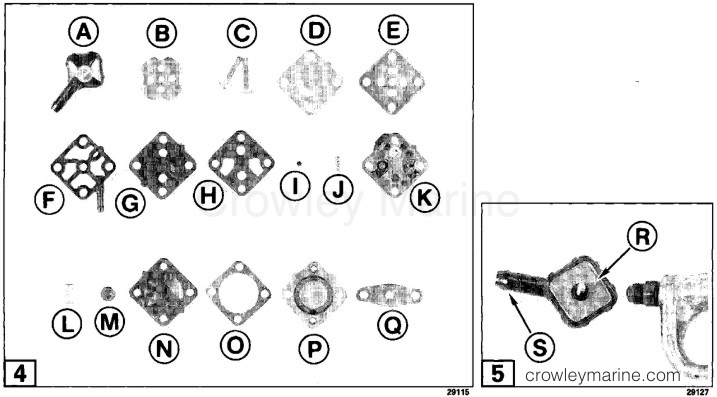 The sketch will be used to reassemble pump correctly. The vapor pump is always assembled as shown. (A) is the inlet, (B) is the outlet, (C) is the pulse fitting, and (D) is a bearing vent fitting. Clean the pump exterior and work on a clean bench to avoid pump malfunctions caused by dirt. If you are working on a Vapor Pump, skip the Fuel Pump Servicing and go to the Vapor Pump Servicing. Remove and place each piece on bench, as it was positioned on your pump. Some will be different than in this photo. Carefully remove and clean filter screen (R), or blow solvent and air back thru screen and inlet (S) in filter cap. Reassemble pump using new parts in kit. NOTE: Some parts in this kit must be installed in an exact position or must be installed in an exact relationship to other parts, or the pump will not work. Other parts must be installed in a certain position to fit hoses, etc. on your motor. Position the pump base (A) so the two tabs (B) are located THE WAY THEY WERE ON YOUR MOTOR. Place the base gasket (1) on the pump base. This gasket was not used in older pumps, but should be installed when rebuilding them. Place the pump diaphragm (2) on the base gasket. The assembly will be easier if two screws (C), or nails, are inserted up thru the pump mounting holes. Place the diaphragm support (3) in the center of the diaphragm, and the diaphragm spring (4) on the diaphragm support. Place the valve housing (A) on the diaphragm spring, with the spring fitting into the recess (B). The two valve housing tabs (C) must be UP (as they were on your motor) and the two drain holes (D) must be DOWN. Place the valve housing gasket (5) on the valve housing with the gasket cutouts (E) aligned with the air-dome spring cavities. The position of the outlet ((B) Fig. 1) on your motor determines the location of the air-dome spring (6) and air-dome support (7) on the valve housing. If the outlet housing was in position (A) or (B), the spring and support must be in cavity (C). If the outlet housing was in position (D) or (E), the spring and support must be in cavity (F). Install the air-dome spring (6) and air-dome support (7) in the correct position (C) or (F). Install the air-dome diaphragm (8) with the holes (G) aligned vertically over the inlet and outlet valves. Check that the spring and support have not moved out of position. Install the outlet housing (9) where the original outlet housing ((B) Fig. 1) was positioned, which is the position used to determine the spring and support location. Install the cover gasket (10). Reinstall the cover with the stamped letter "U" to the outside. Turn the cover so the tab on the cover (A) is next to the tab (B) ON YOUR OUTLET HOUSING. These two tabs must be together or the pump will not work. Check to see that the main diaphragm spring and the air-dome spring have not moved out of position. 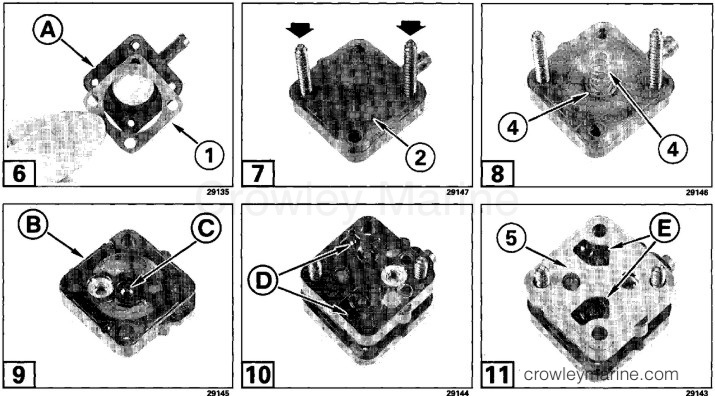 Reinstall the assembly screws (C) or (D) ((C) in Fig. 1). 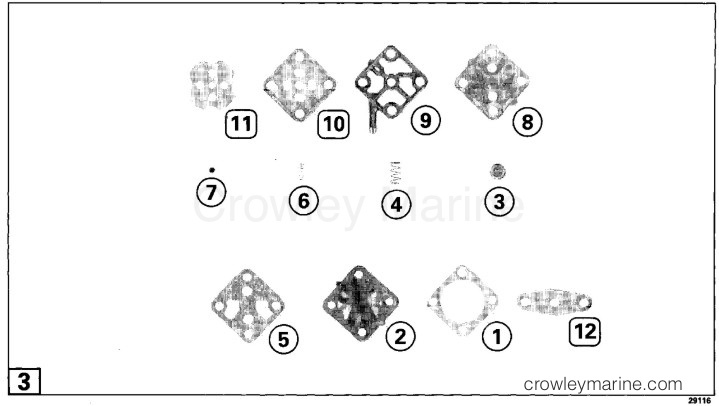 Install the filter gasket (11), with the smaller cutouts next to the assembly screws. Reinstall the filter cap assembly in the original position ((A) in Fig. 1). Check that the tab (E) on the cover is in line with the tab on the outlet housing (9), and is in line with one of the tabs (F) on the valve housing. See Fuel Pump/Vapor Pump Test at end of instructions. 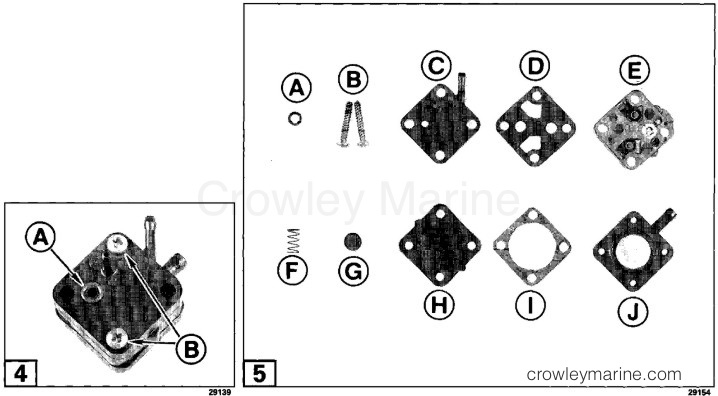 Starting on the inlet-outlet side, remove the inlet O-ring (A) and assembly screws (B). Remove and place each piece on bench as it was positioned on pump, keeping the top of the pump and the parts UP. 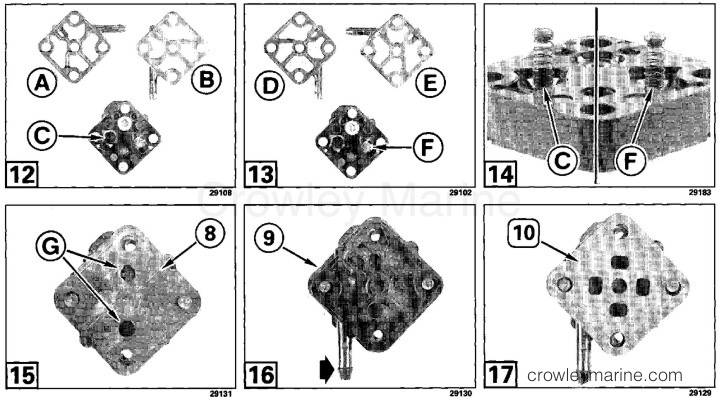 Reassemble pump using the new parts indicated. Place pulse base (A) in position shown, and place base gasket (1) on base. This gasket was not used on older pumps, but should be installed when rebuilding them. Place pump diaphragm (2) on base gasket. To make assembly easier; two nails may be inserted up thru the mounting holes, or screws with heads cut off may be installed finger tight in mounting holes. Place diaphragm support (3) in center of diaphragm, and diaphragm spring (4) on support. Place the valve housing (B) on the spring, with the spring fitting into the recess (C). The valve housing is installed (in this vapor pump only) with the drain holes (D) on the left. Place the valve housing gasket (5) on valve housing with cutouts (E) aligned with housing recesses. 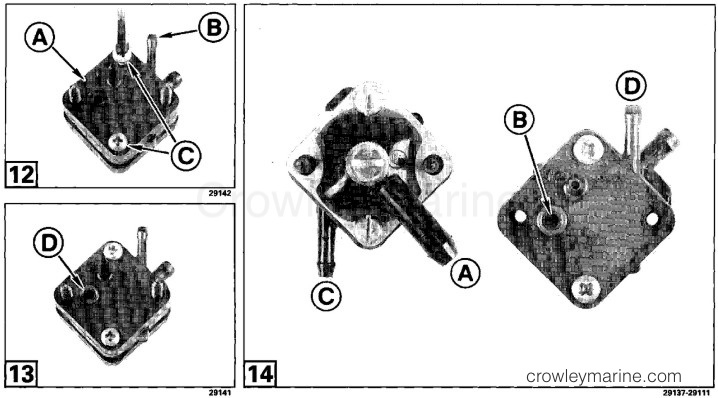 Place inlet-outlet housing (A) on the gasket with outlet (B) pointing UP on the right. Reinstall screws (C) and tighten securely. Remove temporary assembly screws or nails, and reinstall O-ring (D) at inlet port. You SHOULD be able to blow thru the pump by blowing into inlet (A) or (B). You should NOT be able to blow thru the pump by blowing into outlet (C) or (D). Helpful Hint - Use a short piece of hose pressed against inlet port (B) on vapor pump to blow thru. If pump does not pass both tests, disassemble pump and check the parts that must be in an exact position or must be in an exact relationship to other parts. After pump is installed, squeeze primer bulb until firm. Check pump and connections for leaks. Correct any leaks before operating motor.